I’m not a travel writer. I don’t know what kind of writer I am. I just know that some friends and I went to New York City last weekend, and every day that passes is another day that the events that happened go further and deeper into my memory bank. So I’m going to write a little bit about those two days this morning. When we told people about our trip, all of us heard remarks like, “Oh, I’ve always wanted to go to New York City.” Our joint question is, “Then what are you waiting for?” As humans, we postpone. “I’ll go next year,” you think but next year never comes. You get busy. You have obligations. You need the money for something else. You develop health challenges and can’t walk. We also heard, “It must be nice to have so much extra money,” and “I wish I had the money to go to New York.” We aren’t wealthy by any stretch of the imagination, and yes, I realize that’s a much-overused expression. It’s probably earned cliché status by now, but I’m not trying to win “blog of the year” with this post. I’m just trying to urge you to wake up and live. If we can afford it, so can you. BUT, you’re going to have to give up something to get there. Some of us have already committed to going again next year, and we’re staying two nights instead of one. It’s not going to be easy, but we’ve agreed to put away $50 a month. I just need to stay out of Target and stop eating out so much. We also heard, “I’d love to go, but I don’t have anyone to go with. My significant other, friend, fill-in-the-blank doesn’t like to travel.” Don’t use that as an excuse. There are dozens of people you can go with. My husband has been once and plans never ever to go again. That’s unfortunate, but there are so many people who do want to go, and all you have to do is ask around. There are museums and stores and restaurants and lights and libraries and parks and diversity in the Big Apple. And the Rockettes are there. And ice skaters at Rockefeller Center. Oh, and there’s this great little diner, Westway, that’s become a favorite of mine. The service, food, and ambience are all outstanding, and besides, my husband and I spied Brooke Shields there one late afternoon. Here I am nearing the end of my 500-word limit (I’ve been told that blogs should be no longer than this), and I haven’t even mentioned any of our goings-on. I must admit that Sunday was my favorite day, but Saturday had its redeeming qualities too. For example, it was the weekend when young people all over town donned Santa outfits and participated in a bar crawl to raise money for Hurricane Sandy victims. At least that was their original purpose. I’m not sure why they do it now, but I must admit that I enjoyed seeing guys and gals dressed up like Santa, elves, and even trees as they walked up and down the avenues. Quick recap of Saturday: lunch at Westway, afternoon in Museum of Natural History, and late dinner at Juniors in Times Square. So much detail could fit into and between these events. For example, the chicken-cranberry wrap at Westway is to die for, and the native New Yorkers who dine there make the experience more memorable. I sincerely think that we were the only tourists there. The Museum of Natural History is a must-see, and just so you’ll know, you can actually make a “donation” from one cent to one million dollars for a ticket. Most people, however, pay the regular ticket price because they don’t know about the donation aspect. I know because of being tipped off by a tour bus guide. Did we pay one cent? No, the younger set paid full price, and Jeanita and I paid ten dollars each for our admission tickets. And Folks, it was worth much more than that. We walked and gawked for nearly three hours and hardly “put a dent in it.” (Must stop with those clichés.) One final plus to visiting this particular museum is that it’s across the street from Central Park so we got to kill two birds with one stone…er, taxi ride. Three clichés and you’re out. I’ll pick up with the rest of the story later. Two months ago, I had the pleasure of taking a whirlwind trip to the Big Apple with four of my favorite people. From this experience, I was reminded that it’s not possible to do even a tenth of what you want to do in an overnight trip. I also learned that talk is cheap. Some people yak and yak and then yak some more about how they want to travel and that they’d LOVE to go to New York at Christmas to see the huge tree in Rockefeller Center, and the next year finds them saying the same thing. And the next year too. You just have to DO IT and stop talking about doing it. Here’s hoping that if I write some of my memories, you’ll be encouraged to “go for it” next year. On the plane ride home from NYC that Sunday night, I re-read parts of a book entitled The Writer’s Book of Days by Judith Reeves. Towards the end of the book, she urges her readers to use “I remember” as writing prompt. While this is a simple idea, and certainly not a new one, it’s hard to put into practice sometimes. It’s easier to say, “Hey, I remember the summer morning when my oldest child was born” than to actually write about the event itself. That night after reading Ms. Reeves’ suggestion, I challenged my sister travelers to go home and jot down some of the things they remembered. Although they looked at me as though I’d had too much eggnog or something, I hope that they followed through. I did. Watching the cab dispatcher at LaGuardia and admiring his ability to keep everything moving. I also remember seeing a yellow Highlander and wondering if we’d get to ride in it. We didn’t. The wild taxi ride into the city. We were so close to other vehicles that, to Katherine’s delight, we could see their lunch and the books they were reading. When one person gets excited and happy about something, it’s contagious, and before we arrived at our hotel, we were all laughing. Dancing to Christmas music in the lobby with Charles, a bellman at the Hilton Garden Inn, and knowing that this was going to be a wonderful trip. He later danced with Katherine and tried his best to get her to sing. Eating lunch at the Westway Diner, something that’s become a tradition ever since the day Otis and I spied Brooke Shields in a booth there one May day. On the Saturday in December, we had sandwiches and fries, and Elizabeth and I pronounced the fries to be the best we’ve ever tasted. Not being able to locate the Gray Line tour bus and settling for “the other one.” It was okay, but the plastic cover on the top of the bus was old and opaque. We couldn’t see the sights clearly; nor could we hear our tour guide unless we used ear buds. Using ear buds, however, cut out the city noises. It was a trade-off: savoring the sounds of the city or listening to the tour guide’s spiel. I did a little of both. The hundreds and hundreds of Santas and elves doing a pub crawl. I’m still not certain about how and why this event was taking place, but wherever we went, we saw Santas and elves merrily walking up and down the streets and in an out of pubs and restaurants. We were told that they were taking part in an official pub crawl to raise money for Hurricane Sandy victims. Whether this is true or not, I don’t know. I just know it was huge fun to watch them. Katherine and Jeanita wheeling and dealing over scarves and pocketbooks in China Town. Elizabeth later got into the act and bought scarves for the Core 4, a group of work friends. Dinner at La Mela in Little Italy, a high energy establishment with an “interesting” ceiling decoration. We all dined on something different, but I can remember only my choice, clam linguine with clams still in the shells. Joining thousands of other people in Time’s Square after getting back to the city that night. We visited the Hershey store, gawked at the billboards, and bought scarves from what looked like a festive downtown city market, complete with Christmas lights outlining the red roofs. Enjoying a scrumptious breakfast with Elizabeth in the hotel dining room the next morning as we watched the gray and overcast city come alive. Walking briskly to Radio City Music Hall in the misting rain. Drinking in the sights along the way, especially the gigantic red balls and lights. Standing in line at Radio City and enjoying the sights, including a man wearing a red corduroy hat and lots of little girls wearing their winter coats. The moment when Ann realized that our Rockettes tickets were for the 23rd instead of the 16th. No problem. The staff arranged for other seats, even better than the ones we had purchased. 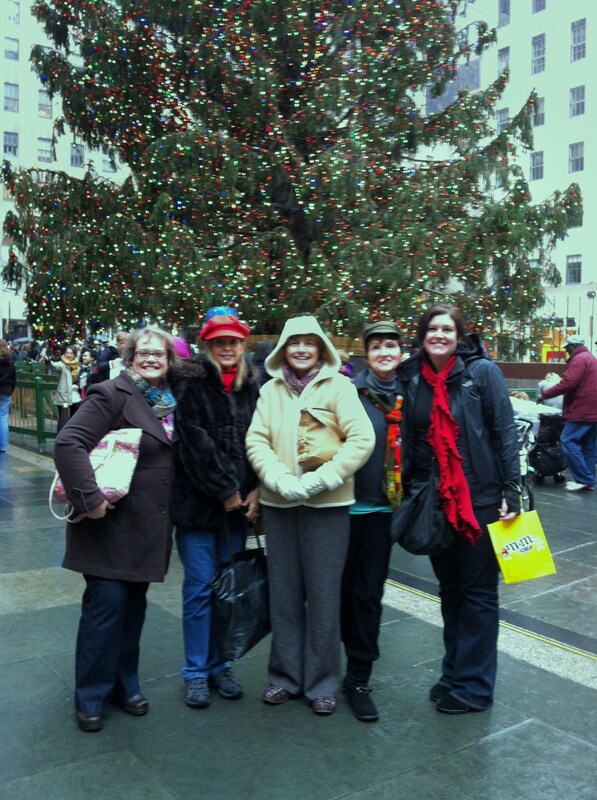 Touring Rockefeller Plaza and having our picture made in front of the Christmas tree. I also offered to take pictures of other people, something I often do when walking on the beach. We oohed and ahed over the ice skaters and then hustled towards the M & M store. Loved it! Three stories high and fun. Subway ride to and from Macy’s. A nice experience that made me feel that we were in a movie. The next time I go to New York, I’m going to learn how to navigate this system because it’s so much less expensive than paying for a taxi or riding a tour bus. However, I highly recommend the latter for people who are visiting for the first time. If it weren’t for the things I’ve learned on busses, I’d think Battery Park was in Times Square! Doing the Macy’s thing. Jeanita and I have this landmark on our Must-Do List every year, but this is the first time we had ever visited the shoe floor. We asked about Uggs and were directed to the second (if I recall correctly) floor. It was amazing! Shoes, shoes everywhere and not an Ugg in sight. No problem. We were sent to a store called Journey on the corner of 34th and Broadway where we were assisted by a peppy young man. Unfortunately, we spent so much time deliberating over shoes that we didn’t have time to visit the Museum of Modern Art, my favorite museum. Alas. Eating at Z Deli across from the hotel after realizing it was too late to go to the MoMA. Great (tasty and substantive) pizza and interesting ambience. There were a couple of picnic tables in the front of the market/deli, and that’s where we ate as we watched the drizzling rain and enjoyed being together. Riding back to airport through Queens and thinking of how dismal the sky was, yet how the little trees and lighted decorations glimpsed inside of apartment windows gave pause for thought. Enjoying airport snacks while waiting at the gate. The Dunkin Donuts flatbread sandwiches taste better there than anywhere else. In about an hour and 20 minutes, we landed in Myrtle Beach with memories of street vendors and China Town and Rocketttes and little girls in their winter coats. From start to finish, our adventure lasted less than 36 hours, but the time together and the experiences we shared will last a lifetime. Okay, Ladies, what do you remember? And what about someone else who went to New York during the holiday season? Do you have a special memory to share?